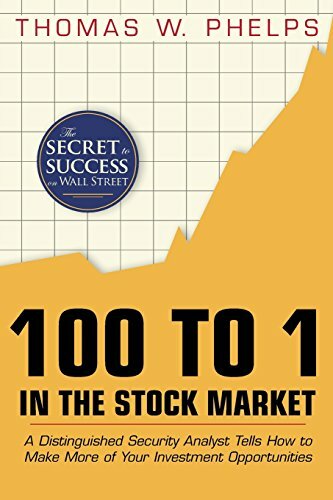 In 100 to 1 in the Stock Market, Thomas Phelps discloses the secrets and strategies to increasing your wealth one hundredfold through buy-and-hold investing. Unlike the short-term trading trends that are popular today, Phelps’s highly logical, yet radical approach focuses on identifying compounding machines in public markets, buying their stocks, and holding these investments long term for at least ten years. In this indispensable guide, Phelps analyzes what made the big companies of his day so profitable for the diligent, long-term investor. You will learn how to identify and invest in profitable business models without visible growth ceilings that will quickly increase your earnings. Worth its weight in gold (and then some), 100 to 1 in the Stock Market illuminates the way to the path of long-term wealth for you and your heirs. With this classic, yet highly relevant approach, you will pick companies wisely and watch your investments soar! Thomas William Phelps (1902-1992) spent over 40 years in the investing world working as a private investor, columnist, analyst, and financial advisor. His illustrious investing career began just before the stock market crash in 1929 and lasted into the 1970s. In 1927, he began his career with The Wall Street Journal where he was a reporter, news editor, and chief. Beginning in 1936, he edited Barron’s National Financial Weekly. From 1949 to 1960, he served as an assistant to the chairman and manager of the economics department at Socony Mobil Oil. Following this venture, he was a partner in the investment firm of Scudder, Stevens & Clark until his retirement in 1970.